Haiti has been in the news because of the terrible earthquake that struck the country last Tuesday, January 12th. Even before the earthquake, most of the news we got from Haiti were negative, relating to the poverty, violence or other natural disasters. But Haiti is also a culturally rich country and that should be in the news and celebrated too. I find it rich particularly in terms of music and dance, and also in terms of visual arts. 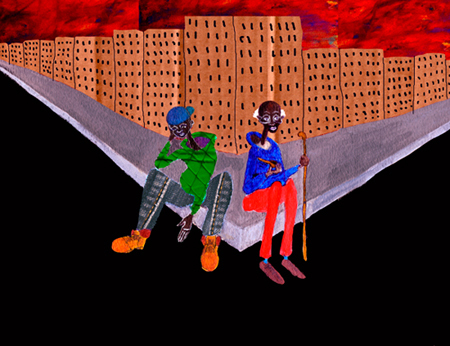 A few years ago I did a series of illustrations inspired by Haitian art. I did these illustrations for a class called Culture and Representation. Disclaimer: people, particularly in America, are sensitive and sometimes offended when someone from another culture depicts a culture that is not their own. I did this in my illustrations, but I tried doing it with utmost respect and with the best of intentions. I do not seek to offend anybody. 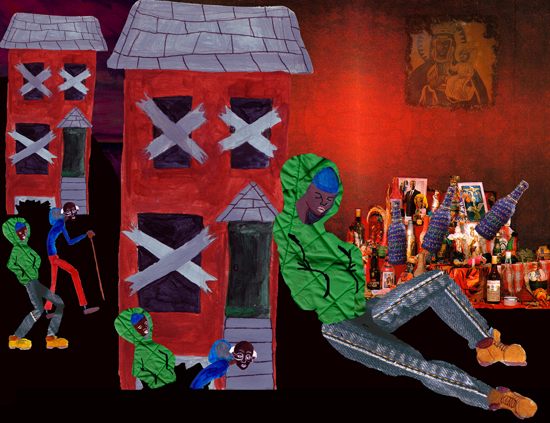 For these illustrations I tried re-adapting a story of Legba to a contemporary NY context. There is a large Haitian diaspora in the city and that is where I was living and studying at the time. Legba is a loa, a spirit from the Voodoo religion, which is depicted as an old man and found at the crossroads. He is the link between the human world and the divine world. He has similarities with the orisha Ellegua in Cuba and to Exu in Brazil. In the story a man (in my story a teenager) friends the wandering Legba. They stay for the night at an abandoned house. 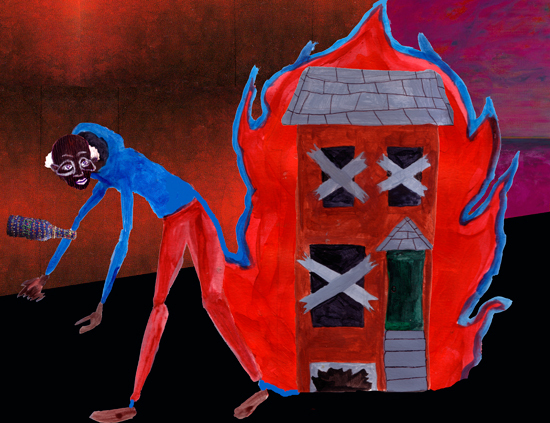 During the night the man wakes up and sees Legba lighting the house on fire. They run from the flames and barely escape. The man is awe struck and asks Legba what he did that for. 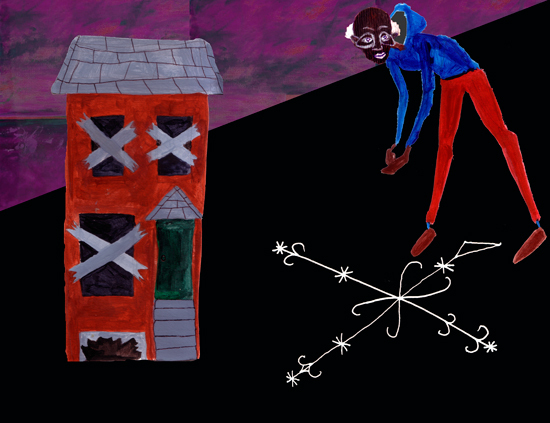 Legba tells him that under the house there is a great treasure buried, that tomorrow when the owner comes he’ll be full of grief, but when he begins re-building his home he’ll find the treasure. The story seems quite poignant now, after the tragedy. I need to find the root source of the story. It might in fact be from West Africa, where Legba and Vodoo have their origin. 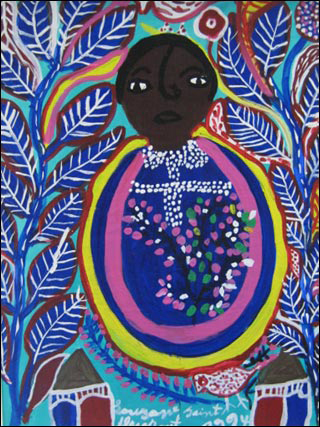 Haiti along with other countries like Brazil and France has a rich tradition of naïf artists. That is, autodidactic artists that use bright colors and evocative, almost childlike, depictions that disregard the standards of traditional western art. I tried capturing some of the spirit of that art in my project. I first became curious of Haiti because of my friend Dj Sabine, check her myspace out: myspace.com/djsabine. She is Haitian-American Dj that mixes traditional Haitian music (and also other African, Caribbean and Latin rythms) with house. To see some footage of the infamous white party in Brooklyn where she d-jays click here and here. I’m on the sidelines, working it out, in the second vid. My idea with my project was to do something similar to what Sabine does, but visually. 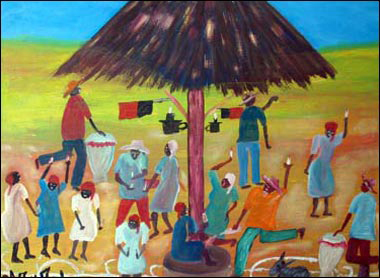 That is, remix traditional Haitian art, primarily naïf art, to a contemporary setting. In fact I use that method to do the artwork that I do now. I try to remix pre-Columbian Mexican art (and other Mexican popular arts) to contemporary beats. 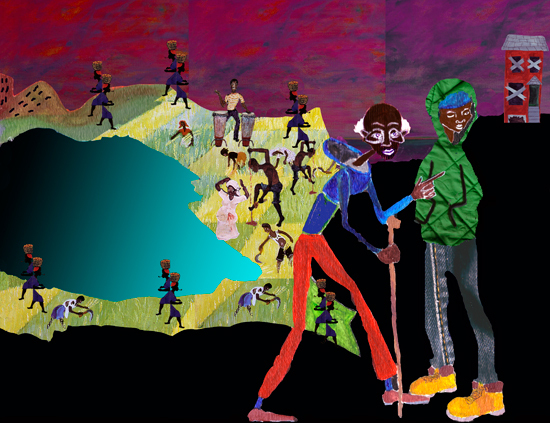 I made the illos such that they connect to one another. Don’t forget to donate and to keep the help to Haiti flowing in the coming weeks and months! Click here for a directory of aid websites. You are currently browsing the archives for the divine horsemen category.